I think there’s one thing we can all agree on: browsing in bookstores is wonderful, joyous, and dangerous. I brave certain peril every now and again for author events or on a whim, and I often see new cover art on old favorites. It is then that I am seized by a compulsion to BUY that-book-I-haven’t-picked-up-in-10-years. This is how I ended up purchasing and rereading The Hobbit for the 5th or 6th time. I was also acting with the knowledge that the film version is coming out (soon! ), and an uneasy thought that I couldn’t remember the particulars. This stirring adventure fantasy begins the tale of the hobbits that was continued by J.R.R. Tolkien in his bestselling epic The Lord of the Rings. The Hobbit begins with, well, a hobbit. Bilbo Baggins is a small being from a quiet corner of Middle Earth, and he would be quite content to be left alone in his comfortable hobbit hole. His life is rudely interrupted by Gandalf (a mysterious wizard) and several dwarves. Before Bilbo has a chance to think, he’s been thrust into an adventure, and is chasing fame and fortune, fighting a terrible dragon, braving a sinister forest, and traveling under a mountain range. It all ends in an epic battle and a tale worthy of ballads. As a chronic re-reader, I know that some books stand up to time, change and life better than others. 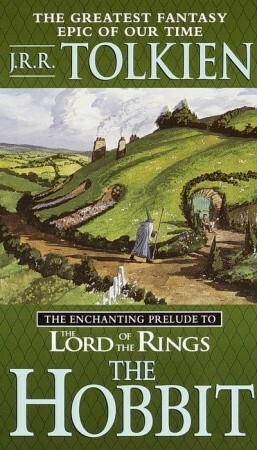 I didn’t expect The Hobbit to wear badly; when I was a child and a teen its adventures thrilled and inspired me. I could live in Middle Earth for days on the mental images, and believe I was deep inside a mountain or forest, on a quest to end all quests. However, when I read this Tolkien classic for the umpteenth time last year, I couldn’t help but feel disappointment. What caused this disenchantment? I can point to a few immediate things, but the first is the obvious: I am an adult. The Hobbit is a children’s book, particularly a children’s book with an omniscient narrator. The narrator’s tone is not anything I would have noticed as a child, but reading it now, I see condescension and little else. Also, the book starts slowly – the majority of the ‘action’ takes place in the second half of the story. Again, something I wouldn’t have minded as a kid, but now that I have less time and leisure, I want to hurry the book up and leave out all those long-winded passages that are not indispensable. Thirdly, there’s a complete lack of character development, and a dearth of any interesting characters. Oh, they are all doing epic things… but there’s no quirk, statement, or turn of phrase that made me want to take a second look at any of them…except the one (human) character without a name. And that is the definition of frustrating and unfortunate. In the end, these annoyances overcame the nostalgia and pleasure in revisiting an old favorite. I confess that I wish I’d left the book in the bookstore and continued to fondly remember the story. Recommended for: fans of Tolkien’s The Lord of the Rings and children (or those who read to them) in search of a story of dragons, dwarves, wizardry and treasure. Tell me: have you reread a childhood favorite and been less-than-impressed? I haven't reread the Hobbit lately, but the last time I reread it I enjoyed it. Maybe that will change. I'm still fond of the childhood favorites that I reread. The Thief, Sandry's Book (and all others by Tamora Pierce), much of Bruce Coville's oeuvre, Watership Down. But there are some childhood favorites I don't feel the urge to reread and I suspect they would be disappointing. I still remember watching the movie before I did anything else. And I'm talking about the old 1970s animated movie. I absolutely LOVED it. So I was thrilled to read it in 8th grade after that. I can't say I've revisited it since then, but I plan to. Hopefully before the film is released. :(. The hobbit is a book I can repeat over and over. But as much as I love Jane Austen I've never been able to reread her books. As much as I anticipate The Hobbit coming to the big screen, I've yet to read the book. Not sure why I never got around to it during my school years, but there you have it. I am always terrified that I will pick up a beloved childhood favorite and find that I can't stand it now -- that it's so flawed that only a child could enjoy it. I seem to have been lucky so far but I'm sure the day will come that I have to let go of something I thought I loved. For now though, I'll stick to ones I know are great and just keep reading those again and again!